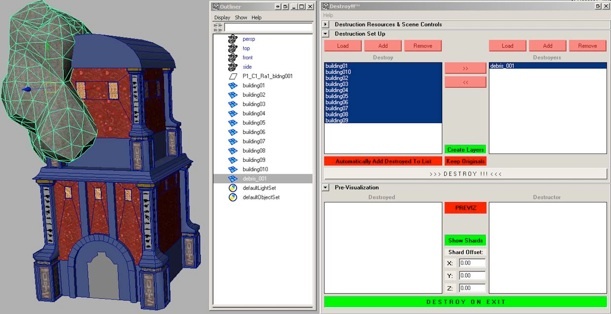 Here’s a solution to the dreaded words: “We would also like a destroyed version of this.” After having created many broken versions of models for both EQ2 and Vanguard , using traditional techniques, I decided to realize an idea, that had been floating around in my head for a while. 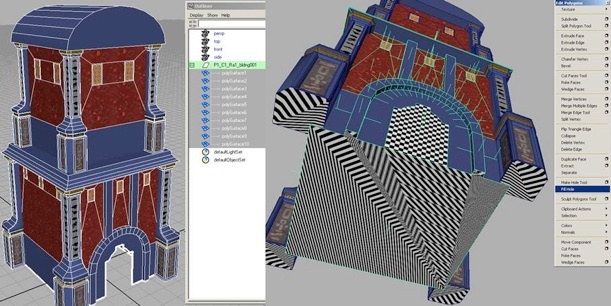 Mesh Preparation – First, extract any combined meshes. Second, close any holes and in effect to that, split necessary edges. Third is to make sure that your normals are facing the right way. Also, unparent the building pieces, freeze transforms and delete history on them. 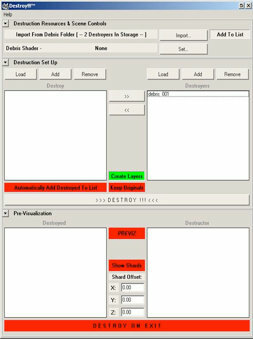 Import Destroyers and set shader – Click import to manually import (1) some destroyers from the set library that is dynamically updated so that you can submit destroyers that you thought worked well if you make your own so that the whole team can utilize them. 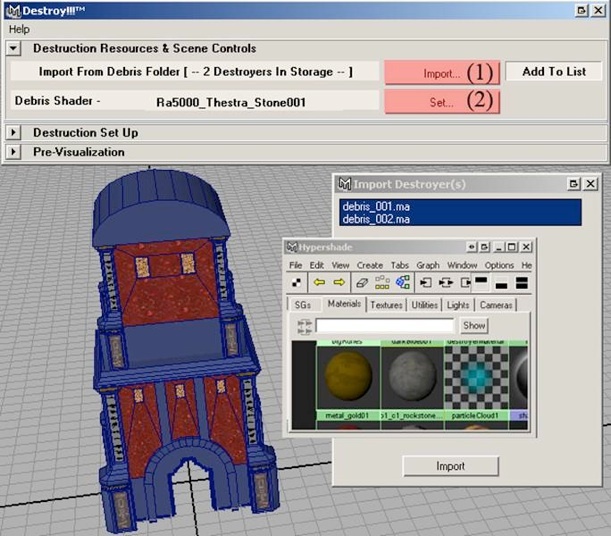 To set the Debris Shader, select a material or a shader and hit “Set…”(2). This material will automatically get assigned to your destroyers when you load them into the destroyers list and subsequently, this is the material you will get on the newly created faces when destroying a mesh. Load objects into lists – Load your building pieces (or whatever you want to destroy) into the “Destroy” list using the Load, Add, and remove buttons. Load the destroyers into the “destroyers” list using the Load, Add, Remove buttons for that list. You can also use the middle arrow buttons (>> and <<) to transfer objects between lists. PREVIZ Mode – When your destroyer is intersected into the building, hit the PREVIZ button (1), this puts the Destroy!!! tool into an interactive destruction state and you will see the destruction when you move, scale and rotate your wireframe destroyers around. When you are in the PREVIZ mode, you can toggle the Show Shards button (2). Shards are the pieces that have been broken off a building or an object, you can also offset these shards so that you can more clearly see what you will get when the building is destroyed. When you are happy with what you are seeing and you want to destroy the building, check the Destroy On Exit (default is on) and exit the PREVIZ mode by clicking the PREVIZ button (1). Conclusion – Below, you can view the results when destroying upon exiting the PREVIZ mode. You can see that the material that we defined in figure 2 has been applied to the destroyed surface on the model. Additionally, you can also choose to Automatically add the destroyed meshes to the Destroy list (1) if you want to continue busting the mesh up more. The destroy button (2) is a shortcut and destroys the mesh immediately without going through the previz step, but does not offer the interactivity to enable you to change the position, rotation and scale of your destroyer mesh. Keep Originals (3) will…well keep your original meshes, even if it has been destroyed (duplicate) or not. I find that the simplest workflow is to not keep the originals and make sure the Create Layers button (4) is checked. It will put all the destroyed parts on a “D_DEST” layer and “D_SHARDS” layer so that you can easily select the layer members and combine into new meshes. We have sped up productivity drastically using this tool and it is not only being used for completely demolishing objects and buildings, but also as a quick way of adding dings, weathering and smaller detail, telling the story of an object.